What can be more invigorating than being able to come together for inspiration, encouragement, and fellowship? Not much! 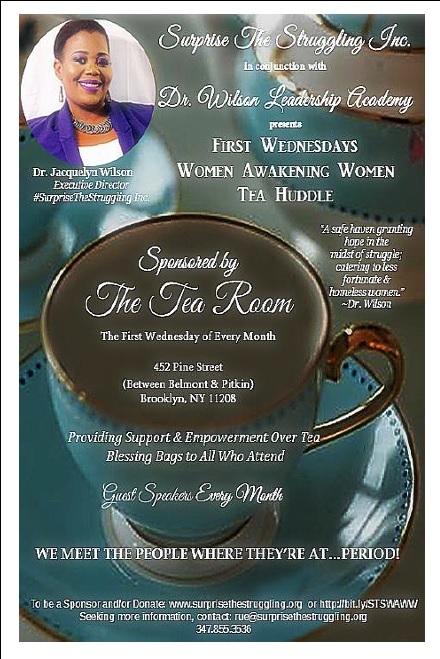 Surprise The Struggling Inc. and Dr. Wilson Leadership Academy’s inaugural First Wednesday Tea Huddle is happening tomorrow night, November 1, 2017, 4PM-7PM, at The Tea Room located at 452 Pine Street (between Belmont & Pitkin), Brooklyn, New York. All women are invited to come out and hear an inspiring word from dynamic speakers, while gathering with other women, sharing the same struggles, triumphs, and dreams—over a cup of tea. 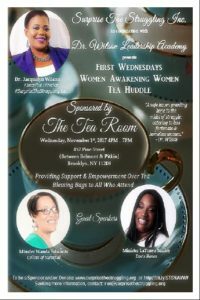 First Wednesdays Women Awakening Women Tea Huddle is a joint venture between Suprise The Struggling Inc. and Dr. Wilson Leadership Academy to bring assistance, awareness, and advice to less fortunate and homeless women and teen girls. You are invited to join Executive Director, Dr. Jacquelyn Wilson tomorrow night for sacred conversation, empowerment, inspiration, and support over a cup of tea and a warm meal. Sponsored Dr. Wilson Leadership Academy and The Tea Room, #STSGlobal will be catering to the less fortunate and homeless women in the community. All in attendance will receive a blessing bag filled with essential items to help take care of the bare personal hygienic needs. Joining the festivities for the inaugural First Wednesday are two dynamic speakers: Minister Wanda Edwards of Colors of Survival and Minister LaTonya Smiley of Eve’s Roses. If you would like to contribute material items, such as food, toiletries, blessing bags, or a check or money order; or if you need further information on becoming a SPONSOR of one or more Wednesdays, please email: Rue McDonald at, rue@surprisethestruggling.org. No amount is too small. We’re blessed to be a blessing. We Meet The People Where They’re At…PERIOD!